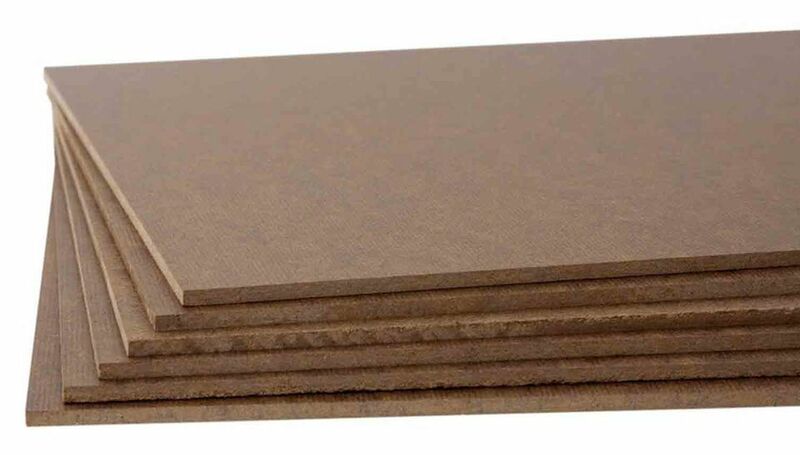 Is There a Place for Medium Density Fiberboard in Fine Woodworking Projects? Medium-density fiberboard, more commonly known as MDF, is a staple of the mass-manufactured furniture industry. Go into nearly any home furnishings store, and you'll find loads of furniture that is made of MDF plastered with veneers made to look like real, finely-grained wood. Why wouldn't manufacturers simply use real wood, instead of a fake product designed to look like real wood? MDF, in a word, is cheap. When compared to "real" wood, the cost of veneered MDF may be as much as one-tenth of the wood it is trying to emulate. It can be made from almost any parts of wood pulp that are left over from the manufacture of other products. Think of MDF as the hot dogs of the woodworking world. Whatever isn't used to make other products is ground up and put together into a semi-appealing package and is used wherever practical. MDF is made from very fine particles of wood. While MDF can be made from cutoffs of dimensional lumber, it more commonly is made directly from logs that aren't chosen to be cut into directional lumber. These logs are debarked, with the cambium layer removed, and then chipped into fine pieces. The pieces are screened, and any pieces too large for use in the MDF are re-chipped. After removing impurities and washing, the fine chips are mixed with waxes and resins which are then pressed into boards. These boards are then dried, laminated, trimmed and packaged for distribution. The advantages of MDF for manufactured furniture is that the material is perfectly dimensioned, has no knots, and machines fairly well. It can accept dowels easily but doesn't hold screws or other mechanical fasteners as well as grained lumber. On the downside, MDF tends to dull blades rather quickly, cannot be routed well (particularly since it is typically veneered at the factory) and requires pilot holes to avoid splitting. It also is very susceptible to water damage. Then there is the formaldehyde. The fine sawdust produced by cutting MDF is quite unhealthy to breathe, so one should always wear a dust mask and work in a well-ventilated area when cutting MDF. Additionally, the veneers on MDF don't prevent the urea formaldehyde from seeping through and evaporating into the air. Painting or fully sealing MDF will help stop the off-gassing urea formaldehyde, but in the case of mass-produced furniture, this step has been skipped. This likely means that every piece of cheap, mass-produced furniture in your home or office is off-gassing formaldehyde. So, the question is, should there be a place in fine woodworking for MDF? Well, I guess that depends on your definition of fine woodworking. Personally, I wouldn't use MDF for anything that will be going into my house, unless that object can be painted or sealed quite well. Many people use MDF for building shelves in closets, but I prefer to use plywood (which also contains formaldehyde) with edge treatments, simply because I much prefer stain finishes to paint on my woodworking projects. However, this is a matter of choice. Since you know the dangers of MDF, you can make an informed decision on whether to use it.